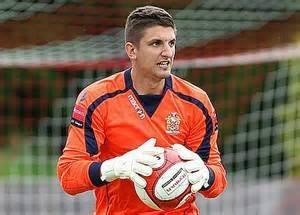 Goalkeeper, Darren Bechet (pictured) has re-joined the club. Bechet, who joins from league rivals Cray Wanderers made his second debut for the club in Saturday's, 1-0 loss to AFC Sudbury. Going in the other direction, is striker Moses Ashikodi. Moses has joined Cray Wanderers and was involved in their fixture at the weekend. Everyone at club would like to wish Moses all the best for the future.  Nathaniel leaves Park Drive Fullback, Taylor Nathaniel (pictured) has left the club and has signed for league rivals, Aveley.